Reliance Fresh claims misleading price comparisons. 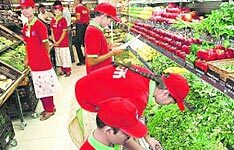 Reliance Fresh has filed a case against Bharti Retail and took it to court over misleading price comparisons, thus causing tension between the two groups. While Reliance Fresh is a part of Reliance Industries Limited, Bharti Retail is the retail arm of Bharti Group. Reliance Fresh has asked the Delhi High Court that Bharti Retail stops making unwanted claims that their Easyday stores offers products at a cheaper price as compared to Reliance outlets. These claims have been made using leaflets and newspaper inserts, distributed across various cities including Ghaziabad, Aurangabad, Ludhiana and Jaipur. The RIL led, Reliance Fresh has also asked for damages from Bharti Retail. The Delhi High Court has issued notice on May 3, according to the court's website. This development has come across as a new addition to the existing rivalry between the two groups which started with telecom in early 2000. This rivalry or competition is also strongly visible in their retail operations. While RIL's retail business, launched in 2006, marked revenue of Rs 10,000 crore in 2012-13, and has 1,400 stores across the country, Bharti, launched in 2007, is a much smaller player with 200 stores. Bharti, though, is now expected to expand operation with its partner Walmart as government opens FDI.